China's Foreign Affairs Vice Minister Liu Zhenmin (R) and Singapore's Foreign Affairs Permanent Secretary Chee Wee Kiong (L) brief the media after the 22nd ASEAN-China Senior Officials’ Consultations meeting in Singapore, April 28, 2016. The United Nations, while upbeat over the outlook for the 10-nation ASEAN Economic Community (AEC), says the region faces several pressing challenges, including reducing its dependence on China’s economy, where growth is moderating. The world body, in its latest Economic and Social Survey for the Asia Pacific is forecasting ASEAN to report slower growth in 2015 at close to 4.3 per cent — down from 5.0 per cent over 2011 to 2013. Shamshad Akhtar, a U.N. undersecretary-general and executive secretary of the U.N.’s Asia-Pacific economic and social commission (UNESCAP), said the region’s blueprint for economic integration is challenged by slower economic growth. Akhtar said the ASEAN region, largely dependent for export led growth, has been affected by a slowdown in external trade. 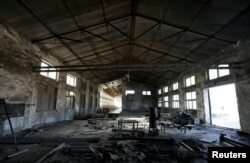 FILE - A closed brick factory building on the outskirts of Beijing, China, Jan. 18, 2016. “What has been a blessing has become a challenge — is that ASEAN is more dependent on China; and what’s happening in China, impacts Singapore, Malaysia, and Thailand, which are more dependent with the PRC [People’s Republic of China] trade. So they need to clearly move towards diversification,” Akhtar said. The main driver of regional growth in past years has been China’s economic expansion. China accounts for some 40 percent of the total gross domestic product of developing Asia-Pacific economies and has surpassed the United States as the largest individual trading partner to the Asia-Pacific. China’s moderating growth, along with overall weak global economic growth, have hit commodity dependent economies such as Indonesia and Malaysia. ASEAN’s manufacturing exports have also been hit by China’s moderating growth due “both to the drop in China’s final exports,” less demand for Asia-Pacific intermediaries, and the slowdown in Chinese demand for final products, the United Nations said. 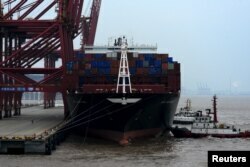 FILE - A cargo ship is anchored at a port in Zhoushan, Zhejiang province, Feb. 14, 2016. China is the largest export market for Singapore and Thailand, and the second largest for Vietnam. For Laos and Vietnam, exports of goods to China account for up to 20 per cent of national output (GDP). But Akhtar also sees other key development challenges for ASEAN. “There are differences in the development gaps. So how the region plays its political economy will be quite critical in trying to lift [Cambodia, Laos, Myanmar, Vietnam] CLMV countries because the more you lift them the more demand will be internally generated in the ASEAN itself,” she said. FILE - Workers coat potteries with enamel in a factory in Bat Trang village, Hanoi, Vietnam. Foreign and local businesses hope Vietnam’s ruling Communist Party will modernize an economy dominated by state companies. Recent indicators point to a deterioration in income inequality, with employment growth in Asia Pacific reported as “weak.” High youth unemployment is also “of particular concern,” the U.N. said. U.N. economists also point to rising levels of debt — private and corporate — in economies such as Malaysia and Thailand. In Thailand, debt serving as a share of income was 27 percent, but nearly 50 percent among the poorest in 2013. “The private debt issue is quite significant for Malaysia and Thailand both in terms of household and corporate debt, and it’s important to stabilize that,” Akhtar said. “There is some sense of de-leveraging emerging on the scene. But unless it is addressed there will be additional challenges to reviving domestic demand,” she said. Akhtar, a former central bank governor of Pakistan, also warned regional countries against competing for foreign direct investment by offering tax holidays and exemptions. “What needs to take place more in ASEAN is to stabilize this because excessive exemptions and [tax] holidays are not going to really help out, but will actually induce a very unhealthy competition to attract resource flows — not necessarily aligned with the comparative advantage,” she said.